The International Energy Agency recommends energy efficiency as the ‘first fuel’ in a country’s energy mix: the most cost-effective energy is the energy we do not use. IEA analysis also shows that energy efficiency has the potential to support economic growth, enhance social development, advance environmental sustainability, ensure energy system security and help build wealth. Industrial efficiency can play a significant role in this area. SEAI advise that all significant industrial plants should be able to aim for 100% efficiency by converting waste energy to useful purposes - these can include conversion to electricity or district heating projects. There is no simple solution to resolving the problems that our island will face when the UK exits the European Union and the potentially devastating impact it will have on Northern Ireland and the Peace Process. The Labour Party supports the call by our sister party, the SDLP, for special status for Northern Ireland within the EU. However, with no settled position among the NI parties and the absence of a power sharing Executive, combined with the stated intention of Prime Minister May for the UK to exit the single market; a possible path forward has been outlined, but with no leaders from the region in a position to advocate within the EU for it. The Labour Party believes there should be a separate strand to the Article 50 negotiations to deal specifically with Ireland-UK issues, and Northern Ireland. Failing that, EU consent should be granted for a bilateral agreement to be negotiated between the two jurisdictions to address border issues. This must be addressed when Donald Tusk and the EU Council provide its negotiating priorities to the EU Commission. The €1.5 billion received by Irish farmers annually must be guaranteed in any post-Brexit adjustments to the EU Budget and the Government must ensure other EU funding streams are protected. There is now an urgent need for increased investment in Ireland to Brexit-proof our economy, and put a greater emphasis on social progress. EU member states must be given more flexibility, particularly when it comes to social investment to tackle the rising tide of anti-EU sentiment. The Rainy Day Fund must be applied to meet the challenge of Brexit. While the broad outlook for the Irish economy over the coming years is generally positive there will nevertheless be a negative impact from Brexit. The Department of Finance has already estimated a loss of 0.5% of GDP growth alone in 2017 before the UK’s exit has even happened. In June 2016, I was delighted to be appointed Labour Spokesperson for Foreign Affairs. Since then, I have been raising issues relevant to Brexit in the Seanad and in my capacity as a member of the Oireachtas Committee on Foreign Affairs and Trade. This week, as the British government triggers Article 50, we in the Labour Party are publishing a detailed and comprehensive policy paper outlining the actions we believe are necessary on the part of the Irish government to face the challenges Brexit will present. We propose the setting up of a number of regional fora to examine how the regions can prepare for and minimise the impact of Brexit. The Regional Action Plans for Jobs must be updated and revised to respond to Brexit, taking into account the policy initiatives that have been proposed. The Government should respond positively to the Irish Congress of Trade Unions’ proposal to bring together trade unions, employers and other stakeholders and establish a ‘Brexit Early Warning System’ to identify sectors and firms at particular risk of Brexit. There are models from other European countries that can provide guidance here. The Labour Party has also called for the re-establishment of an Employer-Labour Conference which would complement and support the work of Government and current industrial relations institutions, and is aimed at promoting industrial peace and stability. It previously provided a forum for discussion and review of developments and problems in incomes, prices and industrial relations. With the advent of Brexit such a forum for social dialogue is critical to address issues as they arise. The Labour Party has published legislation that aims to drive efforts towards closing the gender pay gap in Ireland. The Gender Pay Gap Information Bill 2017 requires medium to large-sized companies to regularly publish wage transparency surveys that would highlight any difference in pay between their male and female employees. As part of International Women’s Week, the Labour Party has also published ‘ Closing the Gap ’, a new policy document to tackle gender inequality in the workplace. We understands that there is a range of factors, including the issue of unconscious bias, which contributes to gender inequality in the workplace. 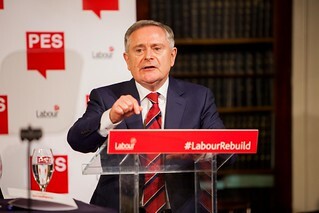 Reflecting on the capital review, Leader of the Labour Party, Brendan Howlin writes about why the upcoming capital review must be meaningful. The Lord Giveth and the Lord taketh away. And so it is with Paschal Donohoe. Three weeks ago, we were treated to an announcement of the Capital Review, the first truly post-crash opportunity to look at our capital funding requirements. The following week, we were briefed on the contracting fiscal space for 2018 and the need for Ministers to pare back programmes in their Departments. In need of headlines the Taoiseach recently told the IIEA that the plan would be a 10 year plan. More ambition or spreading the marmite more thinly. Look at the scope not the quantity. Who knows? Contradictions abound.